We knew this day was coming and now that the invite is finally here, the countdown can officially begin to the launch of the Galaxy Note III. 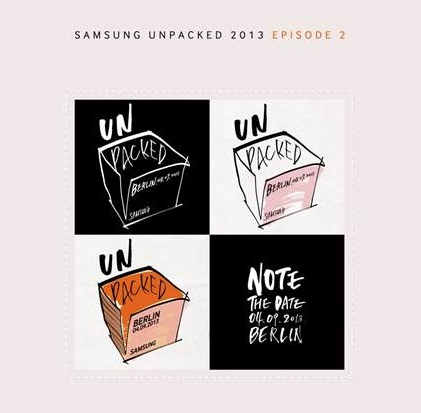 Samsung just sent out invitations for “Samsung Unpacked 2013 Episode 2” taking place in Berlin on September 4th. With the “hand-written” design of the Note (S Pen anyone?) and “Note” the date, the company isn’t coming right out and saying it but we all know what to expect. For those of us not traveling to Berlin to attend IFA, Samsung will both stream the event live and offer a hands-on space (private demos for media only) in Times Square at 1:00pm ET on the same day. The live stream will be available at youtube.com/samsungmobile, so let’s hope the stream can handle anticipated number of viewers. For reference, the Galaxy Note II was unveiled at last years Samsung Unpacked event at IFA in Berlin, which provides all the reasoning we need to speculate its successor will launch this year at the very same event. Let the Galaxy Note III speculation kick into high gear. Possibly, but I think 1,024 levels of sensitivity is more than enough. I honestly think this freaking thing is a little too sensitive. Quite though you might hurt it’s feelings lol. Oh and before we have to hush the trolling whiners about the plastic build, I’m gonna tell them as of now……buy a Hunterf case and shut your hole! Im definitely buying one for my Note III. you can never be too sensitive! current generation Galaxy Note (note 2) has 1024 levels of pressure sensitivity to show thinner to thicker lines based on applied pressure of the tip of the S-Pen to the screen. it is very noticeable but not as noticeable as the one pictured above, so i just thought that they might increase the levels of pressure sensitivity even more on the next generation Galaxy Note. they need to make that screen stronger. The glass is way to fragile. I dunno… I dropped mine 5 times on concrete with my UAG case and survived without a scratch. Way better than my poor HTC G2 lol! One drop in the driveway and she shattered… Sad day cause I loved that phone! I have to say though… My Note 2 might have replaced it on my favorite phone of all time list;) And yes, I must be clumsy lol! what’s the difference between the UAG Navigator and Scout? What do you have? Does it add too much girth to this already girthy phone? Thank you Samsung for giving me a nice birthday gift, how thoughtful! Some but not all! Most are useless gimmicks like the music share thing. im hoping they talk about the next update for the note 2.
i think the issues is partially TMobile’s too! Nevertheless, Tmo and Sammie together has a good track record. Still haven’t received my invites.. haha..
Really? Get a life dude… Sad that you even know that lol! Nice! and let the anticipation madness begin!! lol. As a Note 2 owner, I’m interested to see what Samsung has in store, but I’m still keeping my device for at least 2 more years. I just can’t think of something on the Note 3 that will be game changing. I anticipate it’ll just be like a larger S4. here’s to hoping it’s something revolutionary! COME ON FLEXIBLE SCREEN!!!!!!!!!! Im loving my note2 I might way til the note4 unless they blow my socks off. I plan to switch to T-Mobile and get the Samsung Galaxy Note 3, Tired of my current carrier and been dissatisfied with my service. I know the tech isn’t there yet but how awesome would a bigger screen be that you can fold in half to put in your pocket. Even use it folded to save battery life when you don’t need a big screen. Those flex screens being used for smart watches (Samsung apple etc) might be put to better use once the tech improves! I’m looking forward to the replacement of lithium ion batteries myself. Even with 2 stock note 2 batteries, I wish it would hold up a bit longer. At one point a few years ago, I read about a bio battery that used a fabricated virus that would reproduce or release energy somehow (not a scientist here lol! Just a lowly IT tech) to power cells. It was in the research phase a few years back but maybe the issue was recharging them which would make the most sense or just not reliable. Interesting conceptually though. Maybe they will continue improving lithium cells and make them smaller to incorporate more cells those increasing the mAh rating. I heard the Note 3 chines with a 6-pack of PBR… which is a terrible beer. Ohhhhhh YEEESSSS!!!! lovingmyGN2 but wanting my NOTE 3 lol! 1080p screen, 3 gigs of ram and I pray to the God’s of technology that it’s a exynos octa quad at 1.9 and 1.6 , A Geek can only dream! Just once I would like to see during one of these events they say the phone will be available in a week. They have these reveals then you can’t get your hands one for 3 months. Nice to know that it’s coming but sure hate the long wait’s after these announcements. For sure going to pre-order the Note 3 as an early Christmas present. My GN2 should be paid off by then, don’t have the heart to Jump for it. I really hope that the Note 3 comes stock with 32gb of internal storage plus ext sd-card support. To me that was the biggest flaw of the Note 2. 16gb is just not enough int storage with the size of todays huge apps and games. If Samsung goes with 32gb of storage they will sell sell sell these guys by the boat full.